Few studies in English have been carried out to explore the realm of Saudi short stories in general and women writers' works in particular. 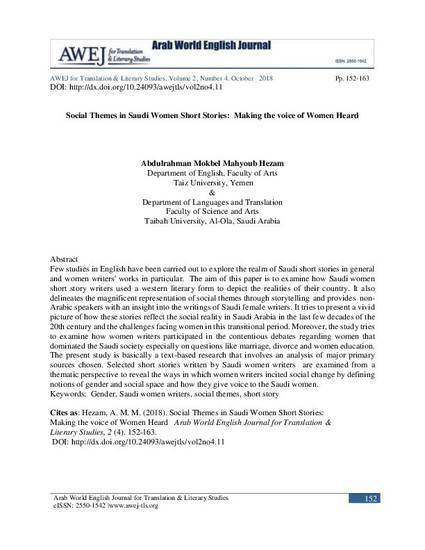 The aim of this paper is to examine how Saudi women short story writers used a western literary form to depict the realities of their country. It also delineates the magnificent representation of social themes through storytelling and provides non-Arabic speakers with an insight into the writings of Saudi female writers. It tries to present a vivid picture of how these stories reflect the social reality in Saudi Arabia in the last few decades of the 20th century and the challenges facing women in this transitional period.  Moreover, the study tries to examine how women writers participated in the contentious debates regarding women that dominated the Saudi society especially on questions like marriage, divorce and women education. The present study is basically a text-based research that involves an analysis of major primary sources chosen. Selected short stories written by Saudi women writers are examined from a thematic perspective to reveal the ways in which women writers incited social change by defining notions of gender and social space and how they give voice to the Saudi women.